Kevin told attendees during a press conference that he would "love to [film] in Mexico." 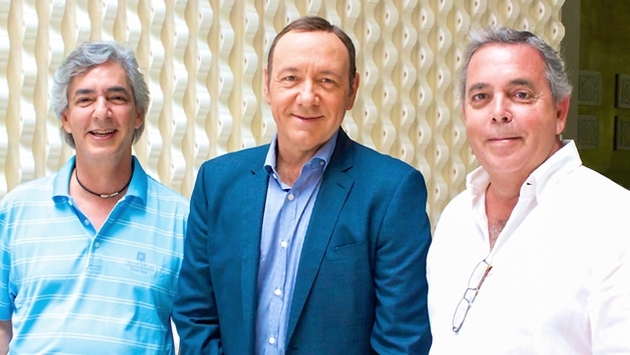 Spacey, who said his favorite food is Mexican, plans to spread the word about the destination. "I'm excited to tell people this is a place to come visit," he said. Attendees, meanwhile, gave the conference high marks. "I think it was an excellent playground for vendors to expose their uniqueness in the products offered," said Alejandro Alegue, sales manager, groups and niche markets for Karisma Hotels & Resorts. "It was also an excellent venue for Karisma to expose its brand position and understand how the competition is performing." Guests can choose among three separate ambiances in this Leading Hotel of the World, including adults only ocean-front, family friendly ocean-front and a Zen-like tropical setting, embraced by the flora and fauna of the Yucatan Peninsula's jungle. All 491 designer-like suites are exceptionally spacious, more than 1,000 square feet each and some with private plunge pools. All feature a Bose sound system, fully stocked mini bars, plasma TVs, high speed internet access, L'Occitane amenities and Nespresso machines.